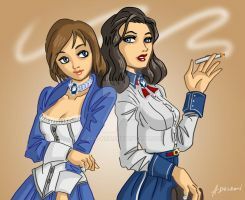 All characters belong to Irrational Games, 2K Marin. Enjoy! "YOU CALLED MAH daughter/little sister/leader/supporter/savior/best friend WHAT!" Ahhhhhjh this is absolutely amazing! The tools by which the Lutece Twins had chosen to reorder reality in their own likeness. Jack and Sigma were the only ones to get truly happy endings. Wasn’t Booker sent to a reality where he didn’t give away Anna Dewitt? Now this would be a team-up for the ages. 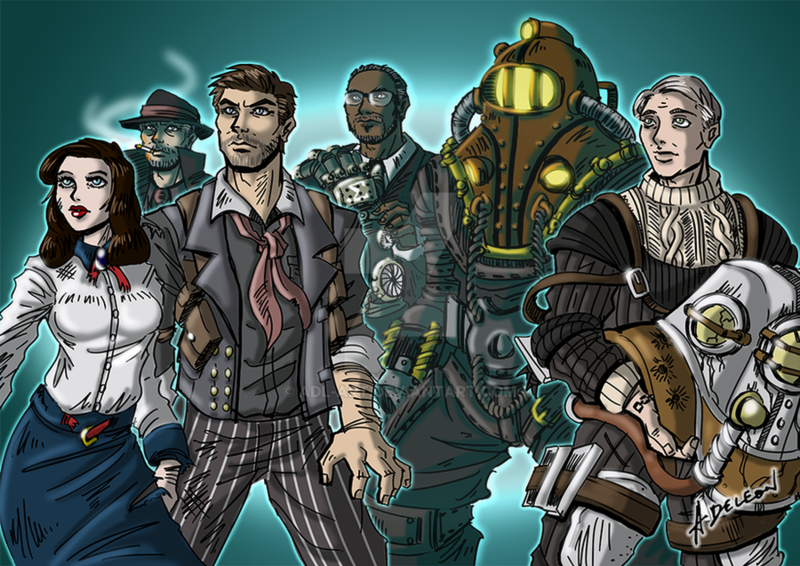 The greatest heroes of Bioshock! Will there ever be a new Bioshock game? Jack in the Big Daddy suit looks so amazing! I've never see him interpreted like that! Nice! I'm curious, though. What's with the hat on Rapture's Booker? The cover art for BaS ep1 that's what booker looks like. Awesome. Could use some Eleanor in there, though. Is it weird I kind of feel sorry for Booker Comstock (my nickname for BAS Comstock)? It's like he's trying to be a good person but doesnt know how to (a good person wouldnt use heat to try to coax a confused little girl out of a vent). He was trying to save Sally. Either way, he's certainly a much better person than Zachary Hale Comstock. To be fair Elizabeth forced him to. 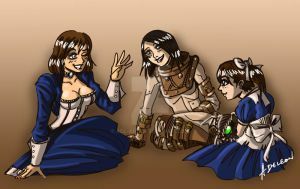 I'm not saying Elizabeth is a bad person either, she did regret doing it and came back for Sally. I do think that it's unfair he didn't get to redeem himself, though. 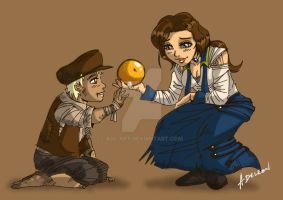 Even Elizabeth said she felt wrong for not letting him redeem himself after the tear-creating her died. He was just trying to save Sally, man. 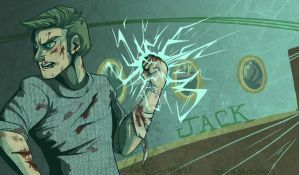 Jack either saves the Little Sisters and returns to the surface to live out his own life, or takes over Rapture and hijacks a nuclear submarine. Porter/Sigma returns to the surface with Tenenbaum in order to create a cure for ADAM. Love to see Milton here :3 Nice work!! 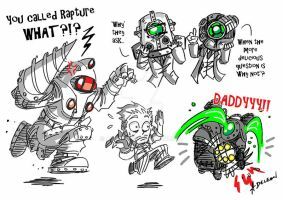 I only hope that 2k does not ruin Bioshock. If I had to have someone else develop it, I would love whoever did Dishonroed, as that was the game that inspired Liz's play. Failing that, Rockstar games, as they will simply NOT be scared to be controversial...Imagine an update red dead redemption engine, with either rapture or columbia? Hope the next installment has a strong & solid storyline. Wish 2K also keeps the stealth & strategy mechanics of BAS Episode 2. Why does Jack have Silver hair? It's meant to be ash blonde/light brown but the desaturation & aqua filter lightened it further. Thanks for the fave! I really love the style of this piece. Very well created. Love this!! so rare that Porter is included in any fanart. Really appreciate the compliment & fave. You're right, i hardly saw any here in dA alone. Cool, looking forward to seeing it!